Why choose yourPatientBoards for your rounding needs? Encourage ongoing dialog between your hospital staff and your patients, as well as the patient's family. That way everyone is on the same page! Involve your patients in all the details and goals of their hospital stay. Multiple layouts can be created to reflect the specific care being received by the patient - i.e., Pediatrics, Oncology, Physical Therapy/Rehab. etc. Reduce patient anxiety and decrease risk of falls. Display care and pain goals, scheduled tests, labs ordered, current med schedules, PT schedules. Easy access graphic inserts allow you to swap graphics with alternate language translations to accommodate a diverse health care community. Suggest a "Best Care For Me Is" section to communicate the areas and level of care desired by your patients and their families. Post Anticipated Discharge Date and Care Plans, or any custom options. Allow patients to visualize a high level of care. Well planned and thought out rounding boards are THE number one communication tool for patient satisfaction, nurses and support staff. Studies show that well designed rounding boards can reduce calls to the nurse's station 50% - 80% per shift. Fewer calls to the nurse's station result in proactive nursing, efficient rounding and improved satisfaction scores while optimizing nursing salary budgets. yourPatientBOARDS become the central location for information for your patients and their families, nurses and staff. No more taping loose pieces of paper to cork boards or walls. No more white boards that appear worn, dirty and leave unsightly ghosting. Once the custom hourly rounding boards are implemented, nurses are reinvigorated when they realize the care they are providing can be even better. Quality Construction, Custom Component Based Graphics and More! Need a little help? We've done the research and have an array of working designs, including over 100 different templates. Pick and choose qualities that make sense for you or let us design a custom graphic from the ground up. 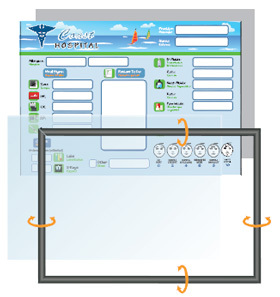 Design the most effective communication vehicle to fit your rounding practices. We will work with you to produce the perfect graphic you will be proud of. A custom, colorful and effective graphic says everything. Printed on a sturdy PVC material, colors always appear vibrant and fresh! Graphic inserts can be printed double-sided to address diverse ethnic populations. A unique, write-on PVC lens sits on top of your custom graphic and works with any dry erase or wet erase marker. Wipes off easily, leaving absolutely NO residue, ghosting or unsightly build-up. No more germ-inviting erasers! yourPatientBOARDS are so easy to clean and keep clean - They'll always look brand new and colorful! Disinfect and sanitize with no more worries of ruining your colorful graphic insert. Lightweight frames are available in two complementary colors, Black and Silver. Our specially designed frames are hinged and easily snap open and closed from the front on all four sides for easy access. 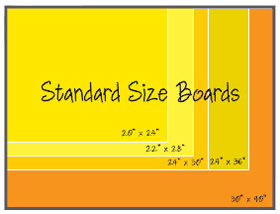 yourPatientBOARDS are available in five stock sizes. Boards can be mounted vertically or horizontally.